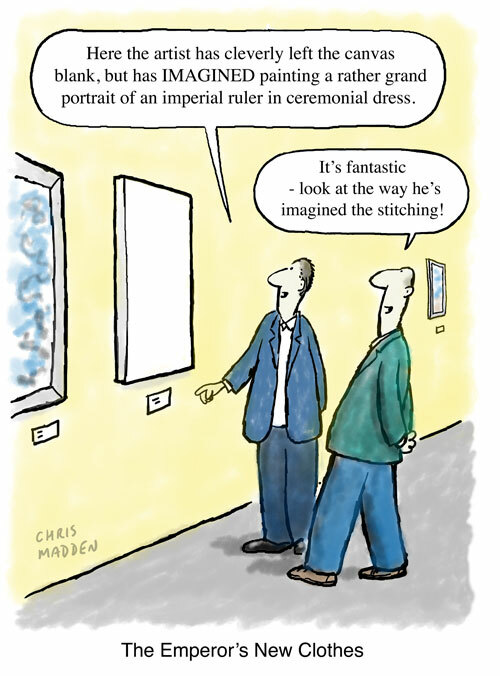 Jokes about art gallery goers admiring blank canvases are a staple for cartoonists who want to satirise modern art. Here’s one of my contributions (although I like this sort of art). Interestingly, the abstract expressionist painter Ad Reinhardt, who painted canvases that were uniformly black, also worked as a cartoonist who satirised modern art. A cartoon about hypercritical student attitudes. A cartoon about the trend for students’ grievances and dissatisfactions to be translated into action, such as in the form no platforming or the demands for objectionable artefacts to be removed. The action is often seen by some as self righteous, self indulgent, censorious and intolerant (ironically, as the students often think that they are acting for the greater benefit of others). The cartoon shows the danger of the students adopting a feeling of over entitlement and thus taking their attitudes out into the wider world beyond their colleges. The inspiration for this image was a news story about students disapproving of a sculpture by Henry Moore, and demanding that it wasn’t displayed on their university campus. A cartoon featuring a map showing the location of the Mondrian Museum. The map resembles a Mondrian painting. This cartoon features in an exhibition in the Chris Beetles Gallery, London, (Summer 2016). Depiction of gender in modern art. Sculpture titled “Man and Woman” where the woman is a washing-up brush and the man is a hammer. The cartoon is an illustration of the staereotypical male and female gender roles, where men perform hard physical tasks and women perform ‘soft’ domestic chores such as washing up. Part of the joke is that the male and female roles depicted in the sculpture are extremely conservative, so this particular work of contemporary art is controversial because of its conservatism rather than (more usually with contemporary art) because of radicalism. Of course the art work may be a piece of feminist art which is ironically pointing out and questioning the standard gender roles in society. The sculpture depicted owes something to Marcel Duchamp, Dada and the use of ‘ready-mades’ in works of art. 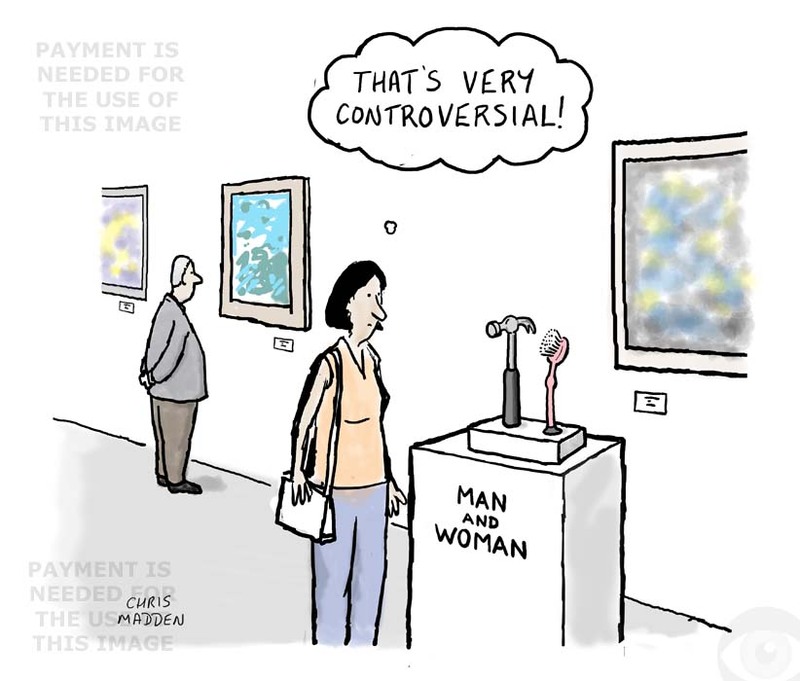 Cartoon depiction of gender in modern art. The cartoon is an illustration of the standard’ male and female gender roles, where men perform hard physical tasks and women perform domestic chores such as washing up. Part of the joke in the cartoon is that the concept of the male and female roles depicted in the sculpture are extremely conservative, so this particular work of art is controversial because of its conservatism rather than because of radicalism (which is the usual reason why modern art is controversial). Of course the art work may be a piece of feminist art which is pointing out and questioning the standard gender roles in society. Feminism and art are meant to be the two themes of the cartoon. I particularly like the fact that the hammer representing masculinity is hard while the washing-up brush representing femininity is soft. Very much caricatures or cliches of gender characteristics. Andy Warhol cartoon. Campbell’s Soup tin cartoon. Cartoon of people looking at an Andy Warhol silkscreen print of a Campbells soup tin in an art gallery. 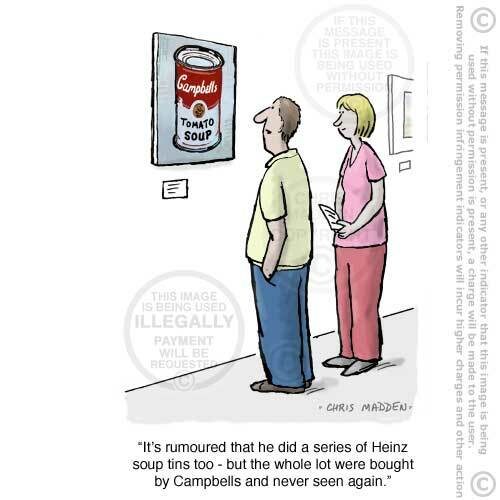 One person is saying that Andy warhol created a series of silkscreen prints of Heinz Tomato soup tins as well, but that Campbells bought the lot and they were never seem again. Modern art cartoon – what is modern art about? 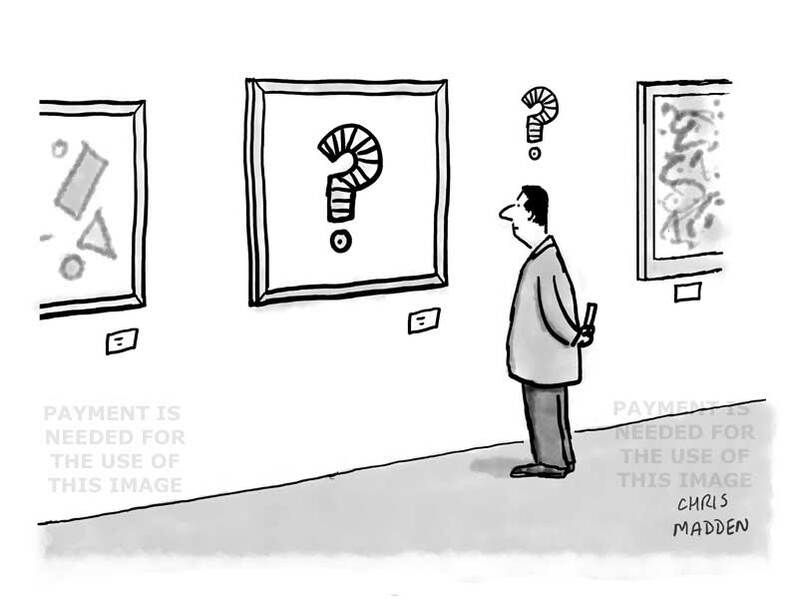 In this cartoon about modern art or contemporary art a person in an art gallery is looking at a modern art painting of a question mark, and is wondering what the question mark means in the context of the artwork. 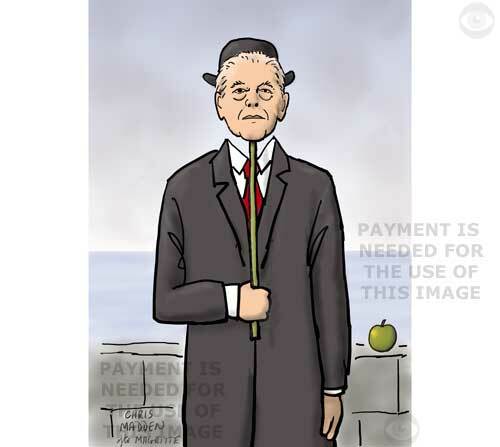 A Magritte cartoon showing a man holding a mask in front of his face (based on Magritte’s image of a man with an apple in front of his face). The mask is a likeness of Rene Magritte himself. Naum Gabo was a Russian born constructivist sculptor. He developed a style of sculpture that involved stretching fine nylon filaments between flat planes to form three dimensional mesh effects – a technique which he called stringing. Rachel Whiteread’s art often consists of concrete casts of the interior spaces of rooms. Her recent work consists of casts of the inside of garden sheds. 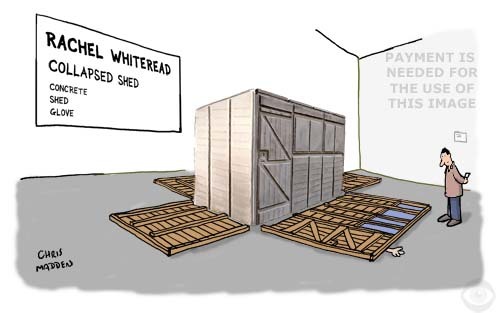 This idea imagines one of her works in which the walls of the shed have been laid on the floor to give the effect of the shed having collapsed, leaving the concrete ‘shadow’ of the space inside the shed. Lichtenstein famously copied cartoon images to create his art. Cartoonists have parodied his work ever since. Quite right too. In this cartoon the Lichtenstein artwork refers directly to Lichtenstein’s own work and to parodies of his work, so it’s a parody of his parodies. Roy Lichtenstein was famous for copying images from comic magazines, and defining the resulting paintings as art. Cartoon showing a giant pissoir floating in the sky. The image is a reference to Marcel Duchamp’s readymade artwork, Fountain. 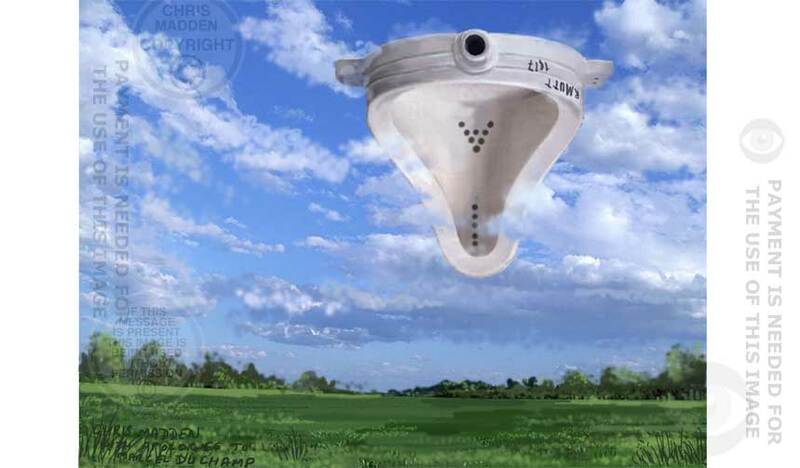 The concept behind the image is that Duchamp’s Fountain hovers above the world of modern art and contemporary art like a giant presence in the sky. Roy Lichtenstein cartoon. Is it art? Roy Lichtenstein was famous for copying images from comic magazines, and defining the resulting paintings as art. Part of the joke in this cartoon is that the cartoon is in the form of a cartoon strip – so it has a Lichtenstein copy of a cartoon strip copied into a cartoon strip about Lichtenstein copying cartoon strips. The term “the curate’s egg” comes from the cartoon titled “True Humility” by George du Maurier, first published in Punch, 1895. The term “curate’ egg” is applied to something that is not very good but that you deliberately find something to be positive about. It is sometimes used to describe something that is generally good in parts but bad in others. 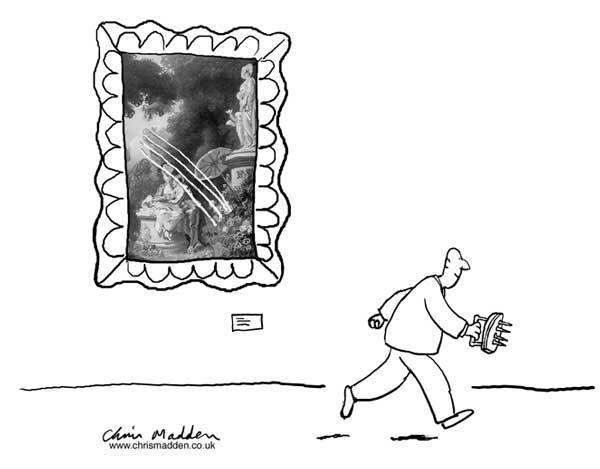 My cartoon treats contemporary or modern art as a curate’s egg – good and bad in parts. Part of the joke is that the artwork in the cartoon is a modernist sculpture that looks like an egg. 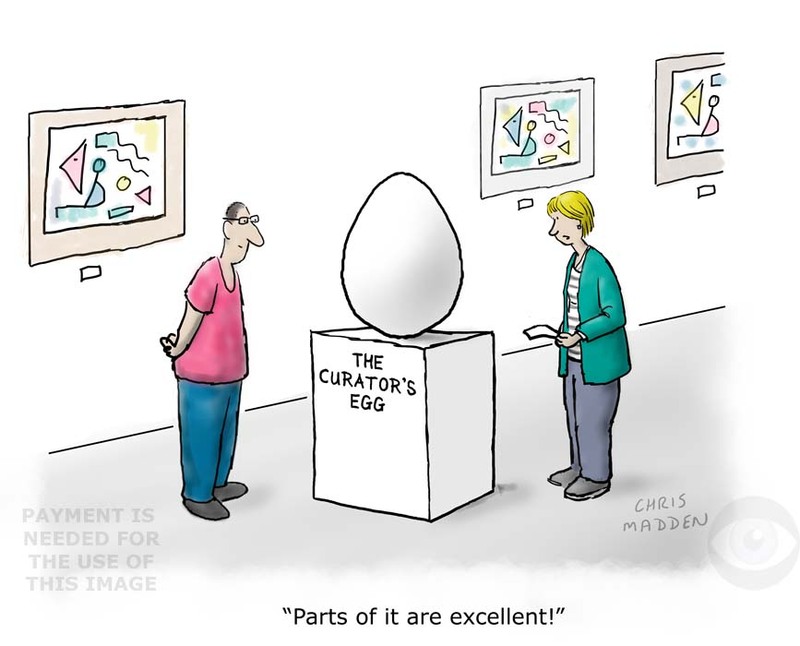 The title of the sculpture is “The Curator’s Egg” (the curator being the person who organises an art exhibition), a pun on the word curate. Copyright infringement cartoon. If you think that this cartoon is arguing in favour of ignoring copyright – you’re wrong! Without copyright to protect our work, people such as myself would go out of business, and no-one would be able to afford to spend time creating anything anymore. Cartoon: Roy Lichtenstein parody of Whaam! Cartoon/illustration: Pop artist Roy Lichtenstein parody. A cartoon on the subject of copyright infringement or copyright violation. As an illustration of copyright violation I’ve drawn a cartoon illustrating the way that pop artist Roy Lichtenstein copied or plagiarised images from cheap comic books. In the case of Lichtenstein’s Whaam! and similar pop art works, does such work count as plagiarism, copyright infringement and copyright violation? Was Roy Lichtenstein just a copyist at this stage in his artistic career? The illustration is based on Roy Lichtenstein’s Whaam! but isn’t an exact copy of it, although it’s close enough to the Lichtenstein version to make the point about plagiarism. The plane that in being hit in the Lichtenstein painting has been replaced by a copyright symbol which is being destroyed. Another artist who deserves to be named and shamed on the subject of copyright violation is Richard Prince, an American artist who, amongst other things, has made almost exact copies of pocket cartoons (such as those found on this site) and sold them for hundreds of thousands of pounds, as ‘art’. I wouldn’t mind if he paid the original cartoonist a percentage. Why doesn’t he do that? You may be asking “Why are the people such different sizes?” The answer is, I don’t know. Craig-Martin’s Oak Tree was in fact a glass of water on a shelf. He now produces a lot of text based paintings that are based on typography and words. The point is that if you get the joke in the cartoon you might just be accused of knowing more about the art world than is strictly healthy, and you really ought to go outside for a walk in the woods where you’ll come across some real oak trees. Part of the joke is that, because I created the cartoon I’m obviously one of those people myself. Michael Craig-Martin is known for teaching and encouraging several of the Young British Artists (YBAs) when he taught at Goldsmiths College. He is sometimes known as ‘the godfather of Brit-Art’. Contemporary art cartoon – blank canvases as art. Emperor’s new clothes? This cartoon was drawn six years ago, in 2006. I’m posting it now because it’s relevant to the current (2012) exhibition at one of London’s galleries of contemporary art, the Hayward Gallery, Invisible. The exhibition is about invisible art and consists to a large part of blank canvases. The cartoon is about the pretentiousness and arrogance of some contemporary art and (especially) conceptual art, and about the way that the contemporary art establishment is capable of elevating even the most banal concepts to a level of deluded meaningfulness. With such art the expression the emperor’s new clothes comes readily to mind. 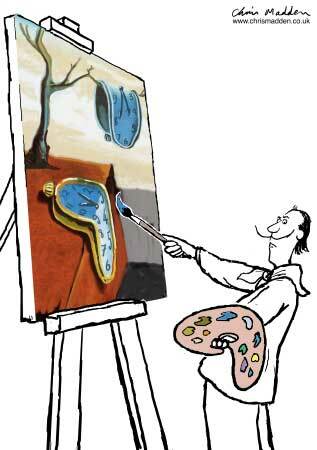 Cartoon showing an artist in front of a blank canvas. He can’t think of anything meaningful to paint, so an acquaintance suggests that he just leaves the canvas blank and gives the resulting ‘work’ a pretentious title. I’m quite a fan of quite a lot of contemporary art, conceptual art and modern art by the way. In fact, one artwork that is about nothing, and that isn’t in this exhibition, and that I like very much, is Antony Gormley’s cloud chamber (called Blind Light) which was exhibited at the same gallery, the Hayward Gallery, a few years ago. This is despite the fact that I’m not a huge fan of Gormley in general. I’d smelt down his Angel of the North. Cartoon showing an art gallery displaying a work of op art by Bridget Riley. The work is a checker board effect that seems to curve into the background in places, giving a disorientating effect. The humour in the cartoon lies in the fat that the observers of the artwork are chess pieces who are standing on a floor that’s in the form of a chess board. To the chess pieces the checkerboard effect in the artwork is not simply an optical effect, it is the nature of the very ground beneath them – so the effect of the checkerboard folding backwards is a profoundly disturbing vision. Bridget Riley is best known for her art composed of black and white stripes, curves and other forms that create jarring, vertigo inducing, dizzy-making optical effects that it’s hard to focus on. If you stand in front of a Bridget Riley painting the image sometimes seems to lose all solidity and becomes a shimmering non-corporeal apparition floating in space (because your eyes can’t fix it to focus on, due to the competing close-packed contrasting lines). The name ‘Op Art’ refers to optical art and also to Pop Art. Both art styles were in fashion in the 1960s. 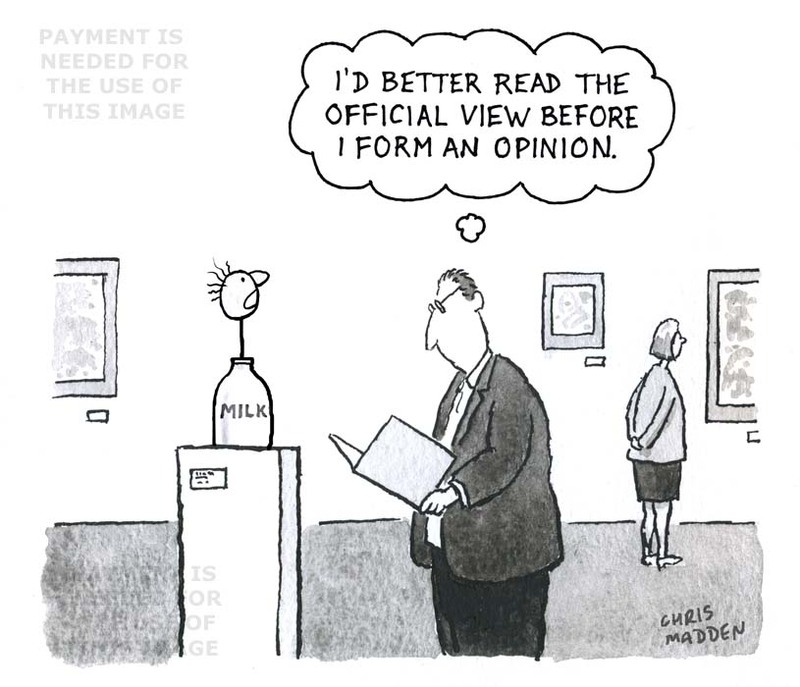 Cartoon about the difficulty of judging modern art. Is this artwork good or bad? Cartoon about the difficulty in accessing whether art is good or bad. 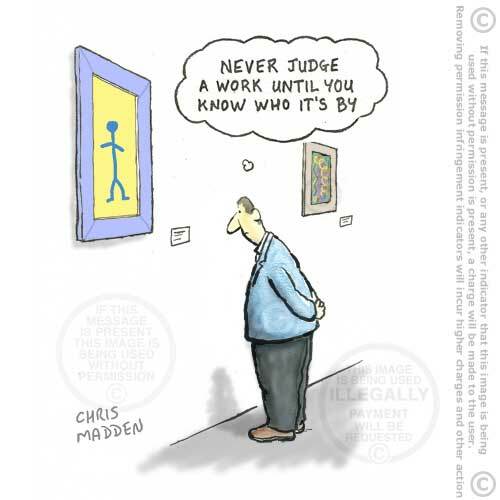 The cartoon is partly an illustration of the role that art critics and art curators have in judging the merit of artworks and selecting them as worthy of display in exhibitions. The argument goes that to the uninformed eye some artwork is of dubious merit when in fact it may be very significant in the history of art or in the development of art movements. Or it may just be art that is ‘difficult’ and ‘challenging’. Cartoon showing a person in an art gallery or museum looking at a piece of modern artwork that shows (to him) little artistic merit. He may well be thinking “A child could do that!” or “I could have done that!”. Realising that there may be more to the sculpture than meets the eye the man is checking what is written about the artwork in the official guide to the art exhibition. This cartoon is about art interpretation, art appreciation, art criticism, contemporary art, readymade art, dada, art made from rubbish or everyday objects. Cartoon about abstract art & the problem of seeing shapes resembling real objects in it. Cartoon showing people in an art gallery looking at a work of abstract art. Even though the artist intended the painting to be purely abstract the audience can’t seem to help seeing objects in it. This is a major problem with pure abstract art – the fact that no matter how much the artist tries it’s almost impossible to create shapes that don’t suggest objects or forms in the real world. The reason for this is linked to evolutionary psychology – because of a perfectly natural and sensible aspect of human psychology. It is the evolutionary result of the need to recognise real objects. Our sense of vision has evolved to interpret all shapes and forms as potentially real things, because in the everyday world that’s all there is. Some things are more important to notice in the real world than others. Human faces are one. That’s why we see faces everywhere, in abstract paintings, in Rorschach tests (inkblot tests), in clouds, in wallpaper. These sightings of faces are what are known as false positives. The reason we see them is that it’s better for the brain to be over-sensitive and to mistakenly see a face where there isn’t one than to not see a face where there is one (it may be an enemy lurching in the undergrowth). Christo was famous for wrapping objects up as artworks. The objects were often huge, such as buildings or bridges (the Reichstag and the Pont Neuf). The cartoon is meant to be a joke at the expense of rich patrons of art who nevertheless know little about, or appreciate little about, art. The cartoon shows the opening preview of an exhibition of Christo’s work. Cartoon about artist Marcel Duchamp’s Dadaist artwork The Fountain. The Fountain is a urinal from a gents’ toilet, or in French a pissoir. The cartoon shows Duchamp removing a pissoir from a toilet in order to turn it into an artwork simply by declaring that it is a work art. The joke in the cartoon is – is Duchamp taking the piss? Is he making a joke at the expense of the artist establishment? Marcel Duchamp is best known through his use of “ready mades” A ready made is a mundane everyday object that is elevated to the status of art by virtue of being removed from its quotidian environment and placed in an art gallery. Duchamp was a member of the Dadaist art movement. Dada was an offshoot of surrealism. Surrealist art ad Dada both flourished in the mid twentieth century. Art education cartoon. What makes something a work of art? 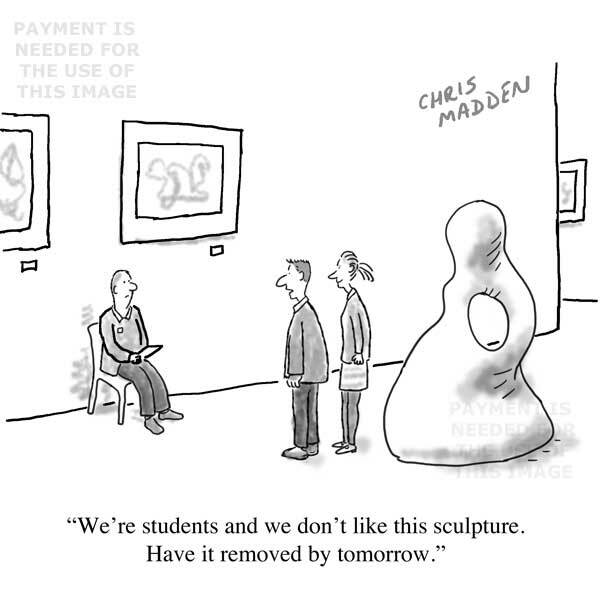 Art education cartoon. A cartoon about the pretensions of the contemporary art and the art establishment (as expressed by a lecturer in an art college). 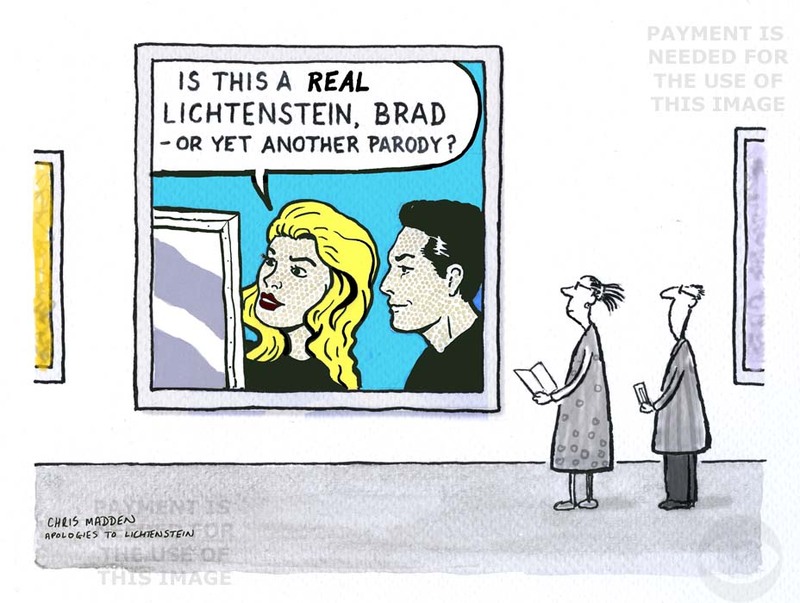 Cartoon about posturing and pretension in the contemporary art establishment. Cartoon showing a lecturer in an art college teaching a student. 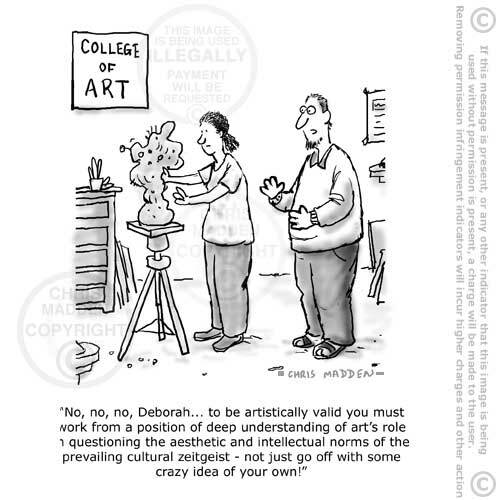 Cartoon depicting artistic justification and rationalisation, artistic validation and criticism, artistic elitism, art appreciation, art history, art movements. Art appreciation cartoon. Should you know who created a work of art before you judge it? Cartoon showing a man in an art gallery looking at a painting. He’s reading the label to see who the painting was painted by before deciding what to think about it. A cartoon illustrating points about art appreciation, art history, what is a masterpiece, how to judge art, artistic expression, modern art, art education. An illustration showing a hand on which one of the fingers is a pencil, which is drawing a picture. Cartoon-like drawing showing a hand with a finger that’s a pencil, drawing a picture. This bizarre or weird drawing looks a bit like a David Shrigley drawing or cartoon. However, it’s by me. David Shrigley drawings are very popular in some sections of the art world right now, and are admired for their weirdness and humour. Exactly how weird or humorous David Shrigley’s cartoons are is a subject of some debate. My own feeling is that they are a bit weird and a bit humorous, but not as much as they are made out to be. 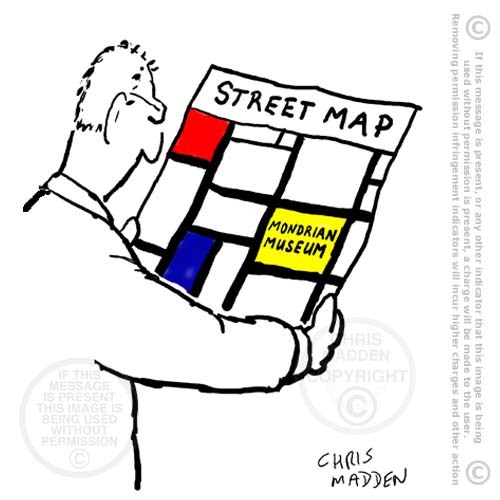 Art cartoon – a street map to the Mondrian museum in the form of a Mondrian painting. 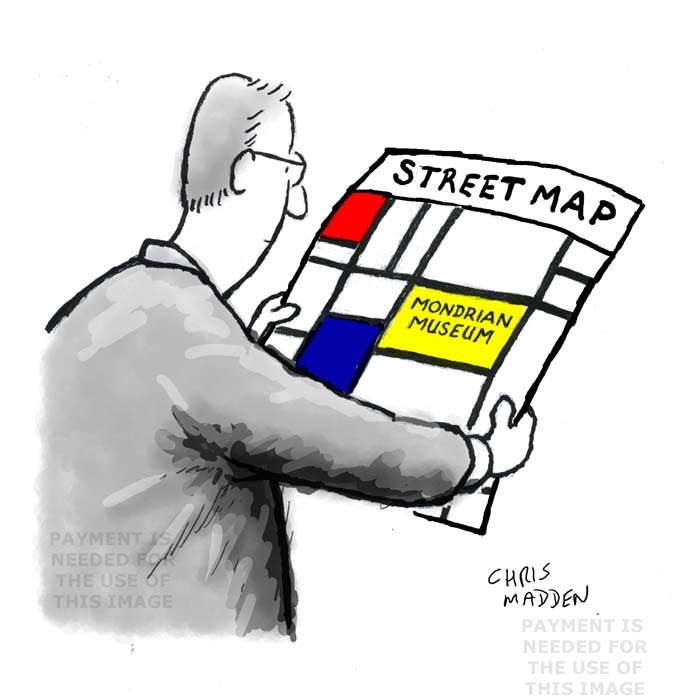 Mondrian cartoon – a street map locating the Mondrian museum – in the form of a Mondrian painting. A cartoon illustrating the way that Piet Mondrian’s art has infiltrated its way into everyday design, such as graphic design and architecture. Mondrian’s influence on contemporary design. Piet Mondrian was a member of the De Stijl art movement, which had quite rigid ideas about what constituted suitable art within the group (as symbolised by Mondrian’s rigid grid layouts). If I remember correctly one member of the group was ejected because he painted his grids diagonally rather than horizontally and vertically. 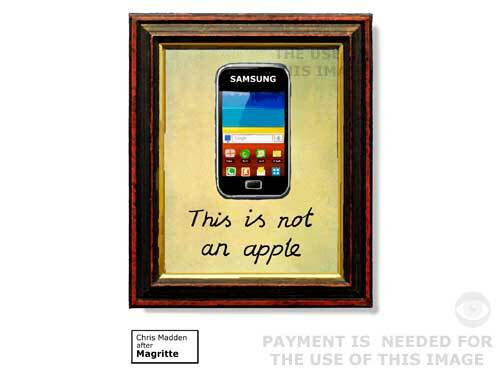 This cartoon featured in an exhibition in the Cob Gallery, London, titled Pastiche, Parody and Piracy (June/July 2014). Cartoon: Roy Lichtenstein parody – turning comic book images into art. Cartoon/illustration: Roy Lichtenstein parody – turning comic book images into art. 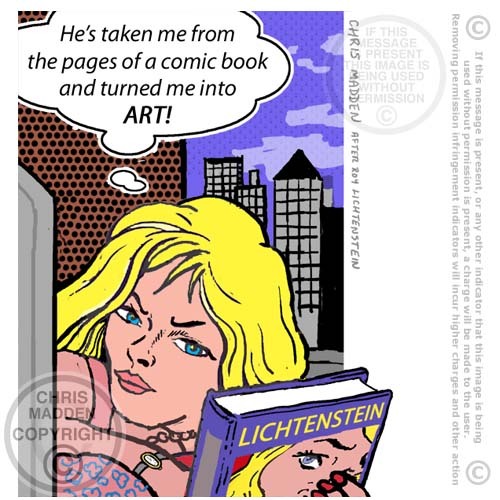 A cartoon illustrating the way that pop artist Roy Lichtenstein copied or plagiarised images from cheap comic books – and through the act of transferring them to canvas transformed them, in the eyes of the art world, into fine art. Does such work count as plagiarism, copyright infringement and copyright violation? The creators of the original comic book art get no credit or mention as creators of the work. They are anonymous, while Roy Lichtenstein gets all of the credit (and money!). A cartoon about David Hockney and his landscape paintings of the East Yorkshire wolds. Cartoon. Since his move to Bridlington artist David Hockney has been painting in the East Yorkshire wolds, studying and capturing the changing light and colour through the seasons. His paintings are to be displayed in a major exhibition of his work, The Bigger Picture, at the Royal Academy of Arts, London, between January and April 2012. The exhibition includes Hockney’s recent experiments in digital painting on an iPad. The cartoon shows a series of David Hockney paintings of the same group of trees at different times of the year, spring, summer, autumn, winter, with the differing light and the different appearance of the trees. The final painting shows the trees burnt down due to a fire caused by a discarded cigarette end. David Hockney is famous for his commitment to the freedom to smoke cigarettes. The joke is that one day his enthusiastic smoking habit may have a down side (although Hockney would argue that that’s his business, not yours). A cartoon about David Hockney, cigarettes, smoking bans, freedom to smoke, fag ends, cigarette butts. Cartoon. Artist David Hockney’s paintings of the East Yorkshire wolds since his move to Bridlington are amongst his most popular images. The cartoon shows the East Yorkshire wolds renamed David Hockney country – a common marketing or branding strategy employed by parts of Britain that can be associated with famous artists or writers (Robin Hood country, James Herriot country and Bronte country are other examples). A cartoon about David Hockney, tourism, tourist branding, popular art, regional identity. 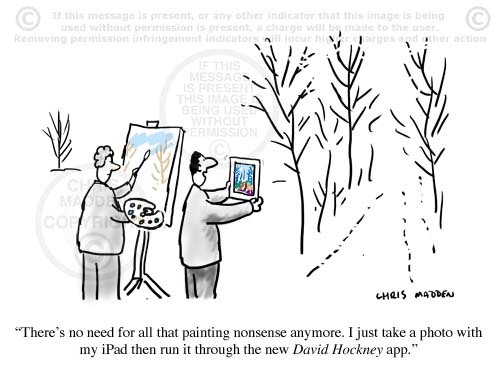 A cartoon about painting on an iPad, as popularised by David Hockney. Cartoon. David Hockney iPad art. Artist David Hockney’s recent work has involved painting directly onto an iPad. It won’t be long before a special ‘David Hockney’ app will be available to let other people convert their photographs into David Hockney style images. David Hockney’s iPad paintings (and other works) are on show in a major exhibition of his work, A Bigger Picture, at the Royal Academy of Arts, London, January – April 2012. A cartoon about iPads, apps, digital painting, David Hockney, digital image filters, popular art, iPad art, iPad painting app.